Policy provides an official position statement of the University; mandating key principles and provisions to enable decision-making. Whilst policy may stand alone, it is usually accompanied by a mandatory procedure; explaining how policy is implemented. However their process for development, review and approval differ, as demonstrated in Figure 1. Policy and procedure are only to be developed when there is a justifiable need clearly identified. The University aims to keep the number of policies to a minimum, and encourages responsible decision-making by staff and students. When policy and procedure is created, policy writers must ensure consistency with relevant internal and external requirements, such as legislation and University policies. When considering the review of policy and procedure, the University has committed to an evaluation of all policies every 3-5 years. The University’s policy review timeframe is benchmarked against the best practice of other leading universities. Procedures should be reviewed at more regular intervals, to ensure they accurately reflect contemporary practice and process. The review timeframe for procedures is to be determined by the Authorising Organisational Unit (AOU). The University strongly encourages AOU's to maintain an active awareness of the operating environment, to ensure the accuracy, relevance and functionality of both policy and procedure. The University is a large organisation with a variety of functions and a devolved decision-making structure. As such the University requires legislative, governance and strategic frameworks that are rigorous, interconnected and streamlined, as indicated below. The University’s policies form a critical component of this interdependent system. 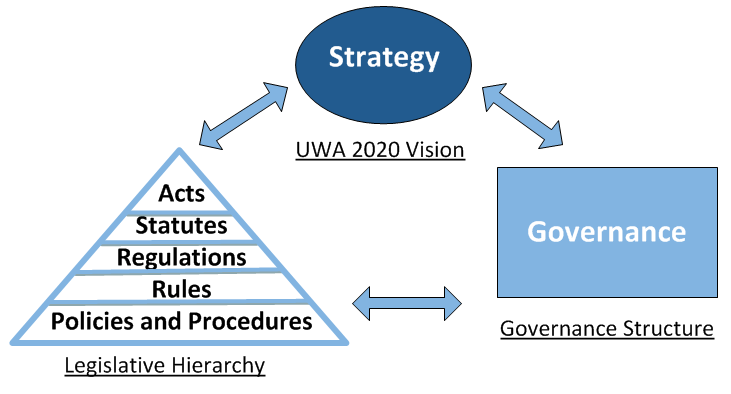 Policies assist the University not only with decision-making and the management of risk, they are also critical enablers of the UWA 2020 Vision. By providing clear, concise and informative statements, the University seeks to enable all its stakeholders with the ability to make informed decisions, which are in line with the University’s mission and values. Delegations are a key element in the effective governance and management of the University. Delegations of authority are the mechanisms by which the University enables officers of the University to act on its behalf. Policies provide the critical framework from which devolved decision-making can occur. Information is available on how delegations are exercised and the procedures for developing the various delegations reports.